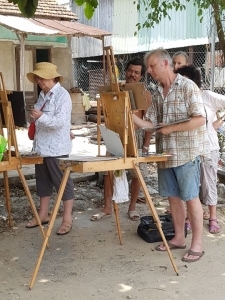 A small party of aspiring students met Peter Brown NEAC and myself (Jac Woods) at London Heathrow ready to embrace our Vietnam experience. We shared high expectations of the adventure and were excited by the prospect of capturing the street scenes, markets, temples and general craziness synonymous with Hoi An. 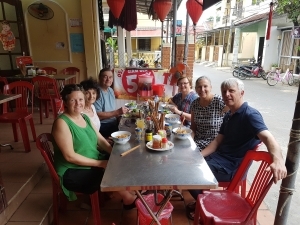 We arrived in Hoi An and met our fellow students who had travelled from Australia and Taiwan for evening drinks. Pete made everyone feel welcomed and the party soon jelled in to a happy little family. To introduce everyone to what Hoi An had to offer artists a local guide walked us around the old town. Some of the highlights and tales of the place were pointed out but Pete was on a mission to seek out the best places to paint at different times of the day as the light moved across the town and when the temperatures would be most suitable for working en plein air. Early starts meant we could make the most of the cooler temperatures and spectacular first light. Also the market in Hoi An came into its own at 5 am. Pete would set off early every morning with those students who had decided to do so at the dinner on the previous evening. The early morning crew would return to the hotel around 9am for breakfast and to plan the next place to paint given the heat and light conditions of 10 am. Everyone would reconvene again around 4pm and decide where to move on to. Most days the painting would round up around 6pm, but Pete would sometimes head out again at dusk to paint at the riverside in twilight. This was a completely different experience again and most of us watched in awe at his endless enthusiasm and sheer energy. 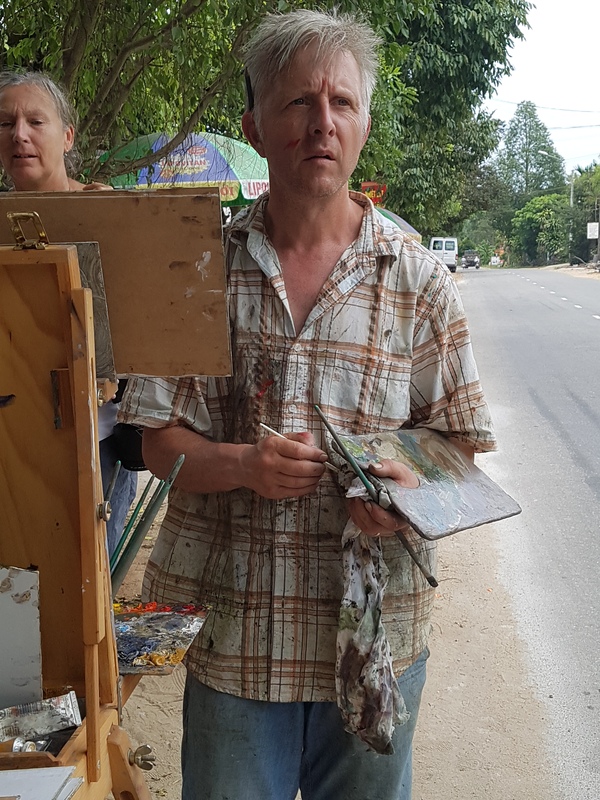 Although Pete was working on his own paintings he was always happy to answer questions from the students and to interact with inquisitive locals. Each day evolved organically to benefit from the best light and what ever was going on in Hoi An. 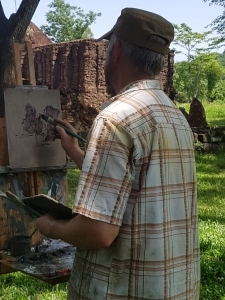 Part of my job was to make sure everyone knew what was happening, when and at what time so individuals could choose to work alongside Pete or independently – some students would revisit places they had started to paint previously, adding detail and colour noticed in different light. 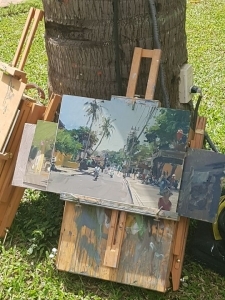 This was an oil painting holiday and one of the biggest challenges for me was tracking down some turps, which I eventually did. The other was finding spare wing nuts for students easels, which I didn’t. It will be added to our suggested equipment lists for future trips. 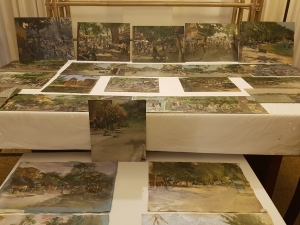 Pete showed everyone how to pack their oil paintings in the suitcases for the flights home using match sticks and tape. 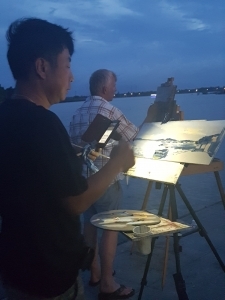 The group painted everyday from dawn to dusk. Our hotel was superbly located in the heart of the old town, so there was no need for transport as everything was within walking distance. 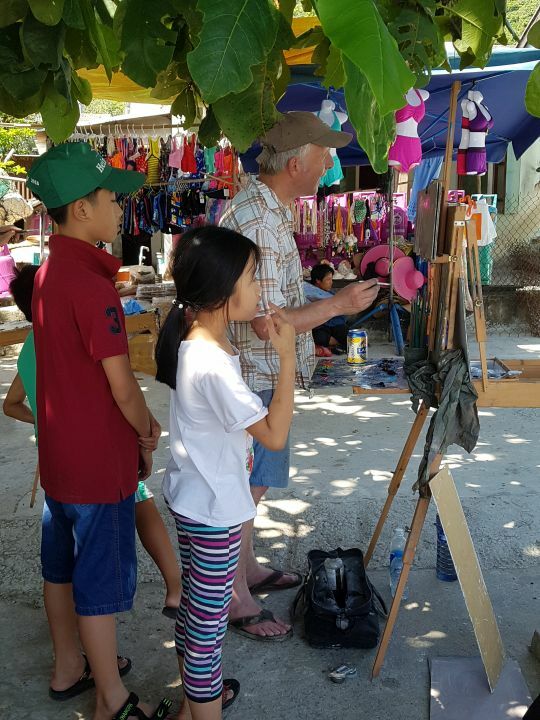 Hoi An is a vibrant bustling town and the hotels tranquil garden offered those students who desired some reprieve a little sanctuary. Staying in one base enables students to settle in to place and quickly get down to painting. It also means unpacking all your gear once. 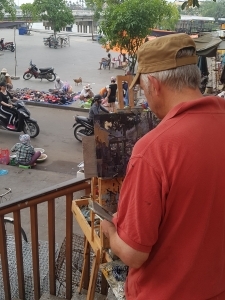 On two separate days we took trips out of Hoi An. The first was to a small fishing village with plenty to paint. Some worked on the water side, some in the village and some in both. In contrast the second day trip was to the historic Hindu Temple site at My Son. Pete was happy painting here, but most the students preferred to do water colour sketches and were missing the street scenes of Hoi An, so we headed back to base for the afternoon, after a quick stop along the way when Pete had spied something interesting to paint. 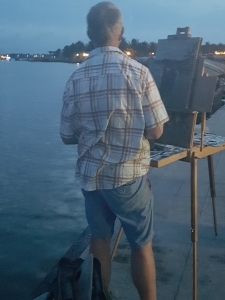 Painting with Pete is inspirational. His easy going, fun and unassuming manner brought gentle guidance and an atmosphere where questions and thoughts were welcomed. He is great fun to be around and we had a lot of laughs over dinner every evening. He is accessible and a pleasure to work with. The end of trip “show” demonstrated the sheer quality and amazing output achieved by us all.